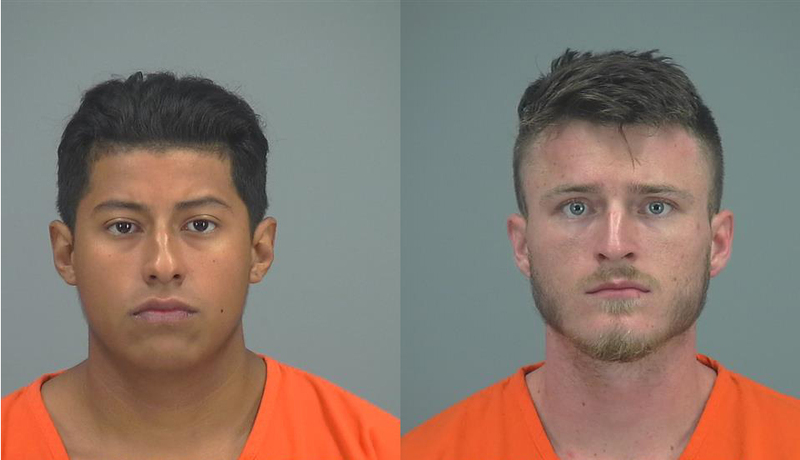 An alleged attempt to sell marijuana ended in the arrest of two suspected drug dealers Monday night, according to the Maricopa Police Department. Jacob Sanchez, 21, and Fabian Andrade, 19, are accused of a host of charges including weapons misconduct, selling marijuana, possessing drug paraphernalia, criminal damage and disorderly conduct. Police were alerted to the alleged incident by a phone call at approximately 11:51 p.m. on Aug. 27. The caller told emergency dispatchers that people inside a dark grey Nissan Infiniti passenger vehicle pointed a handgun at his or her residence near Jeremy and Wilson Streets in the Senita subdivision. Officers identified the vehicle in the same location six minutes later and conducted a “high risk” stop, according to an MPD report. After being safely detained, Sanchez and Andrade allegedly told officers they attempted to sell marijuana to the person who phoned police earlier that night at a different location. The report accuses Sanchez of admitting to possessing the marijuana that was for sale. Sanchez also allegedly told police he handed the drug to Andrade, who then allegedly handed it to the customer. The recipient of the transaction left without paying for the marijuana, the pair told police. Both suspects allegedly said they went to the residence to seek payment. The report alleges the men told police they exited the vehicle and approached the home. Sanchez reportedly admitted to ringing the doorbell and puncturing the tire of the customer’s vehicle with a knife. Officers searching the vehicle used by Sanchez and Andrade reportedly discovered a handgun and scales with “green, leafy residue” located in the rear passenger compartment near where Sanchez was sitting. Andrade reportedly told police he owned the handgun for protection while conducting drug sales, according to the report. Police forwarded identical charges against the pair. Sanchez and Andrade could face charges of misconduct involving weapons (class 4 felony), possession of marijuana for sale (class 2-5 felony), possession of drug paraphernalia (class 6 felony), criminal damage (class 1-2 misdemeanor) and disorderly conduct (class 1 misdemeanor). MPD transported the suspects to Pinal County Jail, where they remain in custody as of Tuesday afternoon.